The QST 106, a fast and smooth ski unveiled this year, is Salomon's quiver killer. Across the board, the Powder Union loved this ski, with exception to those who prefer butters and skiing backward. The solution starts with the Spaceframe wood core, milled to lighten the ski up. An edge-to-edge sheet of titanal that extends beyond the mounting zone and a layer of Salomon's carbon-flax blend top off the construction. The Union reported a light and maneuverable ski with the drive and backbone to respond when they powered down. "I skied these down smooth wind buff off the Lone Peak Tram and they performed excellently," says Dane Weister, a ski tech at Gallatin Alpine Sports in Big Sky. 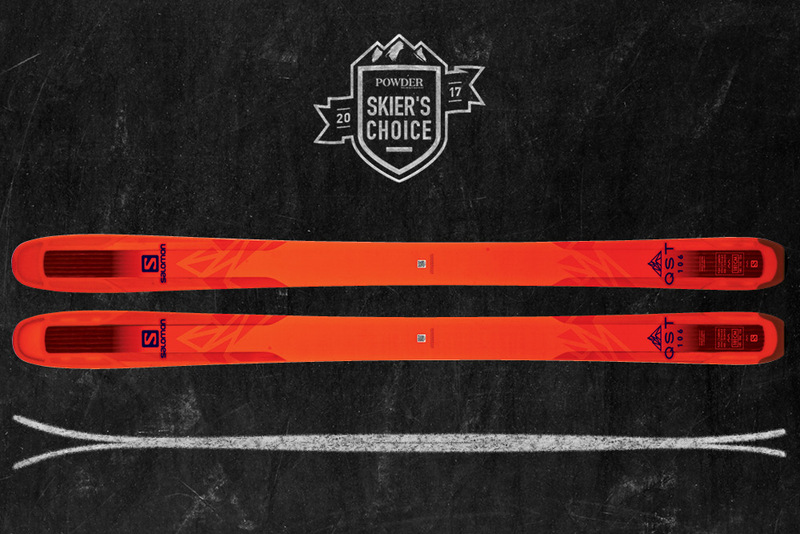 "They are very stable at higher speeds with little to no noticeable chatter throughout the entire ski. The edge hold is very solid and overall they never leave you in doubt." The Stella 106 is the women's version of this ski, varying only in its topsheet and mounting point, and the Union ladies loved it, too.